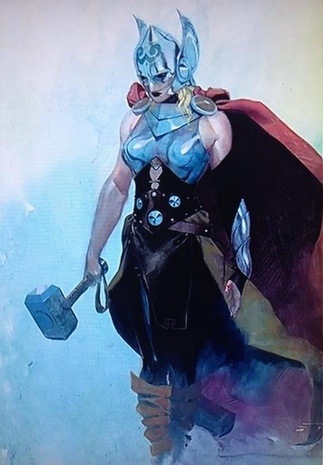 Marvel Comics Announce Female Thor. Monday night, Marvel Comics said that a “thundering” announcement was coming on Tuesday’s The View. With several theories running around, from Angela to Jessica Jones getting their own series, no one was expecting the announcement of Thor losing his hammer and Mjolnir being wielded by a woman. The blonde will not be a Thor replacement, but she will be Thor. Not much is known about the new female Thor. She will be rescued by Thor and then will replace him. This announcement coming on the heels of Thor and Loki discovering they have a sister may or may not be related.